Kerala Government running seven weekly lotteries and six bumper lotteries under the lottery department. The Kerala lotteries department distributing and selling the Kerala Lottery tickets through the distribution network consisting of more than 35,000 agents and above 100,000 retailers. 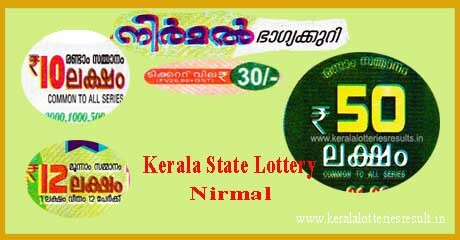 The Kerala weekly lotteries are Akshaya, Sthree Sakthi, Karunya, Nirmal, Pournami, Win Win, Karunya Plus etc, these lottery draws will be held every once in a week. The ticket price for each Kerala Weekly Lottery will be specified in ticket. There are six bumper lotteries runs by the department, the name of the Kerala bumper lotteries are Kerala Monsoon Bumper Lottery, Thiruvonam Bumper Lottery, Pooja Bumper Lottery, Christmas & New Year Bumper Lottery, Vishu Bumper Lottery and Summer Bumper Lottery. The Kerala Lottery results will be published on public medias and online web sites. Kerala lottetry results and prize structure of all the running the Kerala lottery are published in www.keralalotteriesresult.in . The lottery ticket holders can check the previous lottery results and verify the most kerala lottery winning numbers, Kerala lottery guessing numbers etc from this site.